Six journalists from Univision News were detained while interviewing Nicolás Maduro at the Miraflores Palace in Venezuela and their equipment confiscated. They were later released but their equipmeent, including phones was not returned. A team of journalists from Univision News, headed by Jorge Ramos, was detained for more than two hours on Monday at the Miraflores Palace during an interview with Venezuelan leader Nicolás Maduro. They were later released unharmed but their equipment and mobile phones were confiscated. Maduro became upset with the line of questioning after about 17 minutes, got up and walked out, according to Ramos. "He didn't like the things we were asking, about the lack of democracy in Venezuela, the torture of political prisoners, about the humanitarian crisis that they are living," Ramos told Univision after his release. Maduro ended the interview after Ramos showed him a video on an iPad of youths scavenging for food in a garbage truck near the palace. After Maduro left the room his staff seized the video and Univision equipment, including TV and phones. The team was interrogated and put in a security room with the lights turned out. Information Minister, Jorge Rodriguez, told Ramos that the interview had not been authorized, even though it was coordinated with Maduro's staff. "We don't have anything. They took our cameras, they took all our equipment. 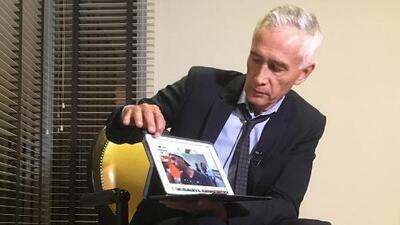 They have the interview," said Ramos, 60, Univision's veteran nightly news anchor and winner of numerous media prizes. "They took many of our personal things," he added. "This is a violation of freedom of expression and a violation of human rights, a violation of all the principles of journalism. They think the interview is theirs, and not ours. They are stealing our work," Ramos said, speaking on a borrowed cellphone from his hotel room. In a phone call with Univision's news director, Daniel Coronell, Rodriguez accused Ramos of telling Maduro that he was a murderer and a dictator. “Hundreds of journalists have passed through Miraflores and received the same decent treatment we give all those doing journalistic work,” Rodriguez said on Twitter. Ramos said he merely asked legitimate questions. "I told Nicolas Maduro that millions of Venezuelans and many governments in the world do not consider him a legitimate president and they consider him to be a dictator," said Ramos. He also told mentioned to Maduro that Venezuela's former intelligence chief, retired general Hugo Carvajal, recently told the New York Times that Maduro was responsible for the deaths of hundreds of youths. The journalists remained under government surveillance after they returned to their hotel, according to Univision. News of the detenton spread like wildfire and was met with strong responses from human rights and media groups as well as foreign governments. “News of their detention and confiscation of their equipment by Maduro’s henchmen are the latest reminder that press freedom in Venezuela applies only to those who are willing to spread the regime’s lies,” tweeted Kimberly Breier, U.S. Assistant Secretary of State for the Western Hemisphere. Mexico’s Foreign Minister also tweeted his government’s protest over the incident. Ramos and the Univision team were later ordered by a Venezuelan immigration official to leave the country on Tuesday. The Univision team held at Miraflores were: María Martínez, Claudia Rondón, Francisco Urreiztieta, Juan Carlos Guzmán, Martín Guzmán and Jorge Ramos.